These are Piltover’s options for Interactive Lore Event V: The Beginning of the End. 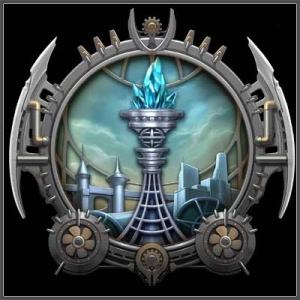 Access to the pyrikhos would allow Piltover to transform Valoran with wondrous new technologies. 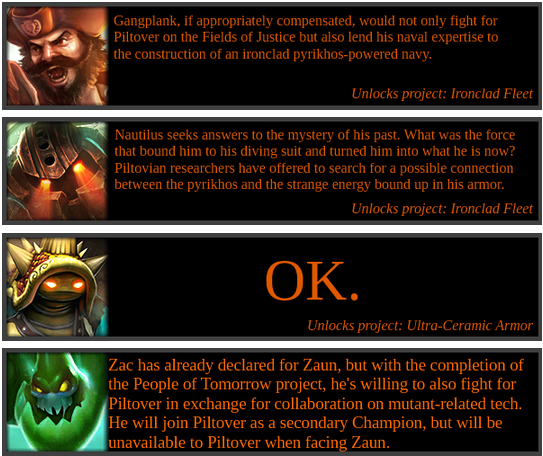 Zaun’s murderous sabotage in the opening weeks of the dispute set Piltover back greatly, but Piltover fights on. Zaun’s recklessness has galvanized the other factions to unite against it. Piltover and Bandle City have cooperated closely for this entire arc. To Rumble’s dismay, the dispute has brought them closer together. Diplomatic pact. Their diplomatic options vis-a-vis Demacia and Zaun will be restricted. For example, neither side will be able to ally up with Zaun unless both sides agree. Also, each faction will be obligated to assist the other to react to a disaster or defend against an invasion. Featured Match bonus points. If either faction wins bonus points from Featured Matches, those points will be shared equally between both Piltover and Bandle City. Summoner substitution. Unlimited Summoner substitution is allowed for Piltover and Bandle City in all matches, including Featured Matches and Tournaments, so long as they are not fighting one another. Champion substitution. Piltover may borrow one Champion from Bandle City in each match, and vice versa. (Champions who are already shared, such as Heimerdinger, do not count against this limit.) However, Rumble will never fight for Piltover. Research surge. The first week after ratification, each faction will receive a +2 cooperation bonus on all research rolls for that week. Combined research. Each week, each faction will receive help from its ally on one project, chosen by staff, generally after informal consultation with members of that faction. On that project, the ally will contribute a second research roll. This bonus would not apply during the “surge” week immediately after ratification. Joint victory. If either faction wins the arc, Summoners from both factions will participate in the vote to select a faction for the next storyline. They will also share the pyrikhos, with the “actual winner” getting two-thirds and their ally getting one-third. Even if both factions vote to form the alliance, it might be derailed if (e.g.) either faction is caught spying on the other. Demacian agents have secretly approached the Mayor of Piltover. They reveal that they believe the disaster in the pyrikhos mines, which was blamed on Piltover, was in fact a sign that a divine prophecy is coming true: if Zaun is not stopped, it is only a matter of time before a horrible new Void War consumes Runeterra. King Jarvan III is considering military action to seize Zaun’s mines and exorcise them of the monsters they believe still lurk deep within. He wishes to know if he can count on Piltover should it come to that. Zaun’s brutal act of sabotage crippled Piltovian research in the early phases of the dispute, killing thousands of innocent people in the process. Zaun then proceeded to blame Piltover for the voidling incursion in the mines. And it is not hard for many Piltovians to believe that Zaun will push the envelope further and further until someone either stops them or it all explodes in their face. On the other hand, what Demacia proposes is turning a relatively bloodless dispute into a full-scale war, in violation of the laws of the League. If Demacia does attack Zaun, then Piltover’s participation would expose it to the same risks as Demacia would face: not only would there be a risk of battlefield losses, but if they fail, they can expect Zaun to demand (and receive) extremely harsh sanctions. Capture would likely lead to sanctions or the loss of classified intelligence to the enemy. If successful: gain a single bonus roll on all projects next week. In addition to the usual penalties, being caught would doom the alliance. Sabotage Zaun’s research or military. If successful: set back Zaun’s research or disable part of the Zaunite war machine for a short time. If successful: increases the odds of a reformist victory in Noxus. More of a long-term play, but could have an impact even in the short term. Piltover may recruit a new Champion.